Publish proposed rules updating the nutrition facts label and serving sizes [OK, but by when?]. Publish final rules updating the nutrition facts label and serving sizes [Ditto]. Publish final menu and vending machine labeling regulations [OK, but by when?]. Collaborate with states, localities and other partners to ensure high rates of compliance. Explore front‐of‐pack nutrition labeling opportunities [Explore? See comment below]. Collaborate with public/private sector parties on nutrition education [Collaborate? See comment below]. 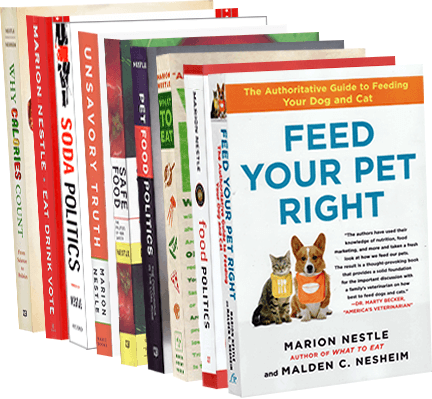 Implement updated standards for the labeling of pet food including nutrition and ingredient information [How about a Pet Facts label for pet foods that someone might actually be able to understand?]. Implement standards for animal feed ingredients. Publish final rule defining and permitting use of the term “gluten free” in the labeling of foods. Goal-setting processes usually include dates by which the objectives are to be completed. These do not, which suggests that the FDA can continue to delay action until 2016. I also do not understand what is meant by “Explore front‐of‐pack nutrition labeling opportunities.” Explore? The FDA has already sponsored two Institute of Medicine reports on front-of-pack labeling. Does this mean the agency is ignoring them and intends further research? FDA needs to deliver on these items, and sooner rather than later. This year? I’m not counting on it.